It's been a while since i've updated the blog. I just wanted to give a highlight of what's been going on at Chelsea Salon this month. First, Chelsea Salon at CONS Project London & Gallery Tour. On 20th June, Laura led a gallery tour of Peckham for the current MA Fine Art students at Chelsea College of Arts. The gallery visited included Arcadia Missa, Flat Time House, Gowlett Peaks, Food Face , Hannah Barry, Sunday Painter, Bold Tendencies followed by a salon at CONS Project London. The salon included UAL postgraduate & PhD students and alumni from the UAL and Goldsmiths College. 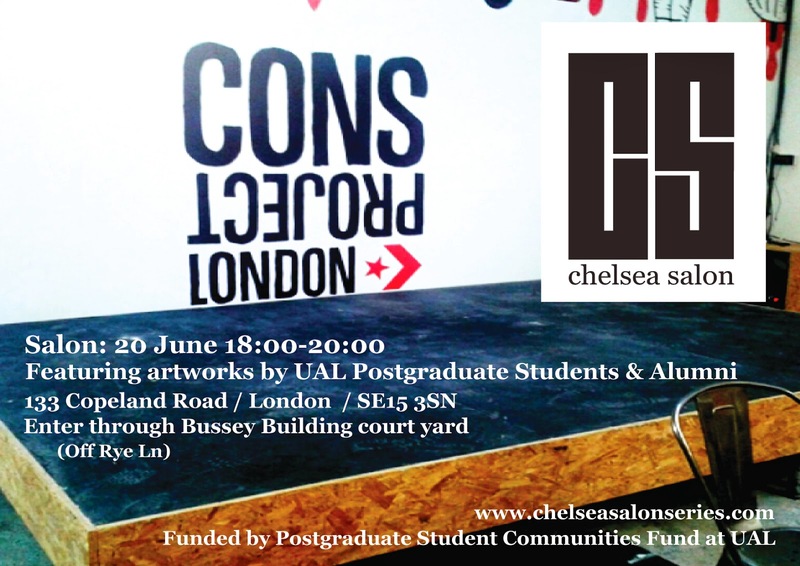 The salon was supported by UAL Postgraduate Community Fund and hosted at CONS Project London. I felt the event was a great success in widening the professional practice development of the artists involved by providing the opportunity to meet and interact with other artists outside of an academic setting. This is not to say that the experience wasn't an educational one. In fact, it is still based on educational methods that provide frameworks for group understanding through engagement in open-ended task, in this case negotiating one's practice into the space where the salon was being hosted, that function to form a kind of collective analysis of postgraduate and alumni communities at UAL and beyond. My reasoning for feeling that it was a success is based on the relationships that where developed through participating in the salon. These relationships include interaction with other postgraduate students from the different UAL colleges as well as professional artists. Barbara Steveni was kind enough to drop by as well. Second, After Beuys / Launch of Alumni exhibition space in E Block. 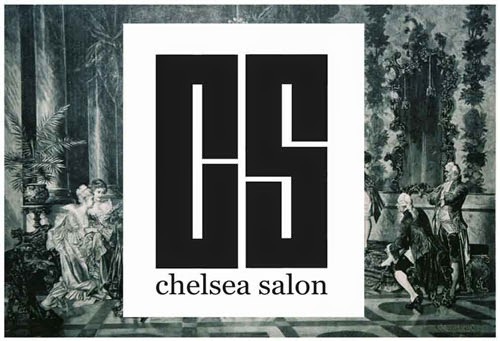 This month has seen Chelsea Salon claim a previously unused space at Chelsea College in E Block. 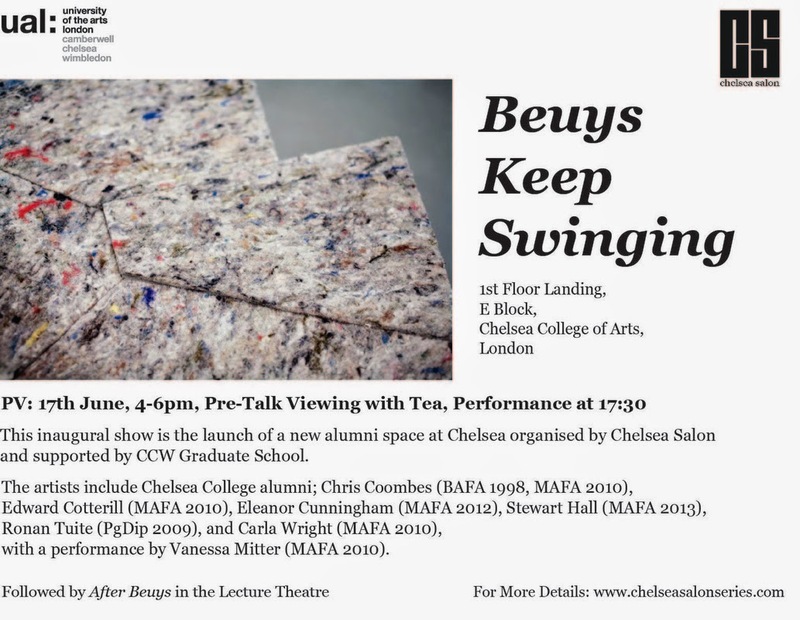 The Landing Space is a recently launch space within E block at Chelsea College where Chelsea Salon will be presenting a series of exhibitions that lay focus on works of recent graduates from Chelsea College of Art & Design. The Landing Space in E block is located in a building that is most associated with administration and research and holds base rooms for MRes, MA Curating and Collections, and PhD students. Cheslea Salon aims to provide a platform for interaction, dialogue and exchange between these groups, the rest of the college and alumni. The PV was not without it's hitches. We had technical issues with the AV equipment so were unable to show two of the works. We did, however, have an excellent performance by artist, Vanessa Mitter, which ended in a magnificent crescendo of treacle, water and spoken elements of Beuys' theories on art in English and German that were barely audible due to the restraints the artist wrapped around her mouth during the performance. 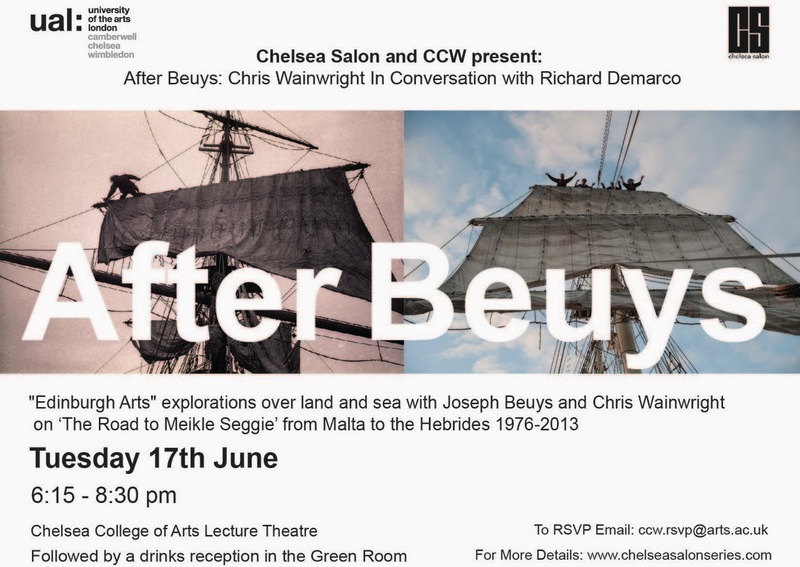 The PV was followed by Richard Demarco and Chris Wainwright in conversation in the lecture theatre at Chelsea College. It was a rare opportunity to bring artist / impresario, Richard Demarco, down to London from Edinburgh to speak about his views on art and the role art plays in society as well as his history with artist, Jospeh Beuys. Chris Wainwright shared his history working with Richard Demarco and his own artistic practice. We'll have the video made available on our website soon. Finally, our last event in June is the upcoming Chelsea Salon Film Club. 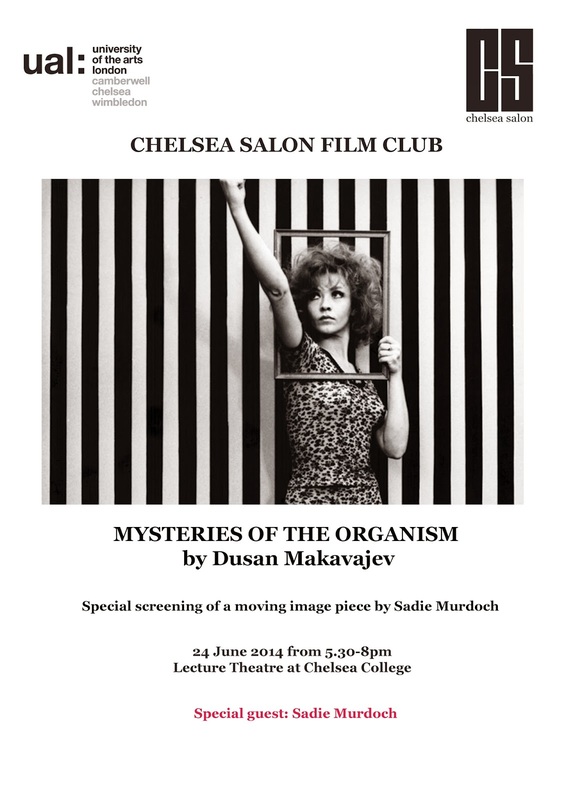 On 24 June between 17:30-20:00, Chelsea Salon Film club will be presenting a Mysteries of the Organism (1971) is a 1971 film by Serbian director Dušan Makavejev that explores the relationship between communist politics and sexuality, as well as exploring the life and work of Wilhelm Reich. This film was selected my Chelsea member of staff and artist, Sadie Murdoch, who will also be showing a moving image piece before the featured film. We're very pleased to be working with AV technician at Chelsea, Monika Kita, who has developed a programme that includes moving image works by artists and invited guest who select feature films. For more details, please check our website. Thank you everyone and I hope you have a lovely summer. We're planning to be quiet for July and August but you never know what opportunities might arise.